Across the dimensions and beyond space comes BrokenSea Audio Productions’ incarnation of the intrepid Time Lord, Doctor Who! Whether you are new to the series or a fan from decades past, you will thrill to the exciting adventures of Mark Kalita as time’s champion in this fully dramatised audio series based on the legendary BBC TV show. 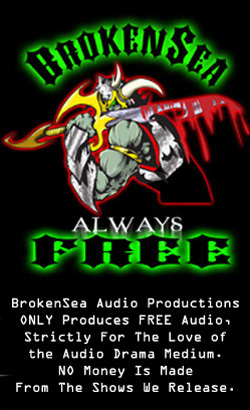 Launched on March 2, 2007, BrokenSea Audio Productions is a group of self-proclaimed “Audio Hooligans” who create and podcast audio dramas and talking books in .MP3 audio format. Their first season of Doctor Who stories was written and produced by a number of the same team that carried the show through its second season at Darker Projects Productions, thus making the series also a continuation of sorts from the end of Darker Projects’ second season. BrokenSea’s intention to continue the Mark Kalita Doctor’s adventures was announced in December 2007, with releases following in January 2008. Darker Projects went on to produce a new Doctor Who series using an alternate reality version of The Doctor with a different actor. In 2009, BrokenSea’s Doctor Who series was a finalist in the prestigious Parsec Awards audio competition under the category: Best Speculative Fiction Audio Drama (Short Form including Independents). 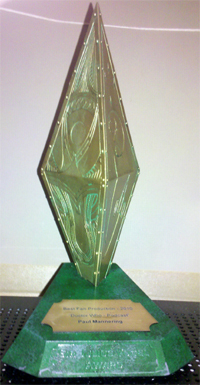 In the late Spring/early Summer 2011, shortly after the release of Quorum of Time, BrokenSea’s Doctor Who series won the pretigious Sir Julius Vogel Award for best fan production at the New Zealand National Science Fiction Convention (NatCon) in Auckland, NZ. Paul Mannering, lead writer for that season, accepted the award on the group’s behalf. Pictures of the trophy, created by WETA Workshop, can be found here: Julius K. Vogel Award Trophy. Beginning with the Season 4 opener, Viracocha, the show also introduced a new variation of the classic Ron Grainer & Delia Derbyshire theme song. Having begun a friendship with post-producer, Stevie, K. Farnaby, Jay Ellington Lee, a former sound engineer at the BBC Radiophonic Workshop and originator of the Sci-Fi Jazz genre, proposed the idea of adding his signature style to the theme song for the BrokenSea show. Combining their talents, Jay and Stevie, along with Neaman Lyles on saxophone, developed a jazzy variation of the theme exclusively for Mark’s Doctor. BrokenSea continues to produce freely downloadable audios in a variety of genres every Thursday. Among their other fan tribute releases are extended adaptations of: Planet of the Apes, Logan’s Run, Battlestar Galactica and Escape from New York. The group’s current Executive Management Team (aka “The Lord High Hooligans”) consists of: Paul Mannering, Bill Hollweg, Mark Kalita, Stevie, K. Farnaby & Damaris Mannering. And yep, will adding RSS links on all the show pages, when I catch a mo. Been busy rebuilding the site and getting the epsiodes back online again etc. The new site looks great! Im glad to see you folks made it back. there was a big broken sea space in my mind that needed filling. Hey, awesome — love these dramas! Keep it up! Glad U’re enjoying. And yeah, we’re having a blast making em, so no plans to stop for a very long time to come. Getting ready to start listening to these soon. But I’m a bit confused as to the continuity with this series. I saw on the season 1 rss feed that you guys had come from over from Darker Projects, but the most current DP Doctor Who episode was about 6 months ago, long after Broken Sea started with Doctor Who. Do you have a suggested listening order? Essentially Mak’s Doctor was at DP. About 5 years years ago, he came across to BrokenSea. All 4 Seasons here are ours M80. DP continued on with their own series with a new Doctor. So basically start here with Series 1 – Episode 1. And of course enjoy the listening. Gotcha! Thanks, and I’m sure I’ll enjoy it!